In a warm display of Christian unity, the Mount Calvary Seventh Day Adventist church in Salem City recognized Cristina Chillem, director of Catholic Charities’ Salem Health and Wellness Program, for her efforts to improve the nutrition of Salem county residents. At the podium during Mount Calvary’s regular Saturday Sabbath worship service, Stephen Fields, director of Community Service for the church, described Chillem as someone who goes above and beyond her work responsibilities. Fields was speaking about the nutrition demonstrations Chillem facilitates at food pantries throughout the county, including the ones at Mount Calvary where food is distributed every Tuesday and every third Thursday of the month. At these distributions, Chillem hands out sample tastings of healthy recipes that use less than five ingredients. The ingredients are also mainly items that residents without transportation can access at local food pantries or corner stores. The recipes also feature a fresh vegetable or fruit that Chillem will bring in bulk so every food pantry client can take the fresh ingredients along with a recipe card. Lessons include strategies for eating healthy on a budget, like shopping seasonally, methods of food preservation, reading food labels, and comparing unit prices. Chillem also offers assistance for SNAP applications and referrals to other social services. 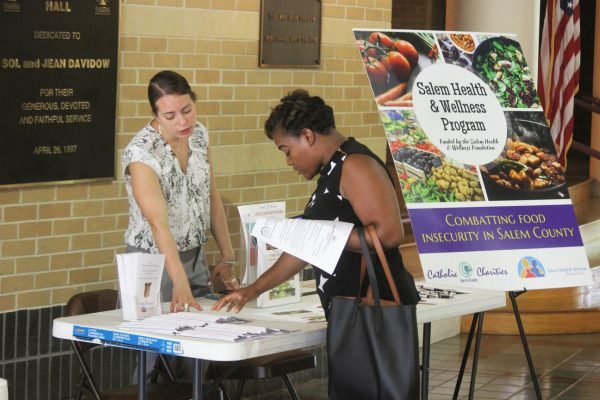 According to a Robert Wood Johnson Foundation annual report, Salem County consistently ranks near the bottom among New Jersey counties in terms of the health of its residents. The county has a 21 percent child poverty rate, compared to New Jersey’s 15 percent. And 34 percent of Salem County residents are obese compared to 26 percent statewide. It is second in the state for highest rate of chronic illnesses such as diabetes and heart disease. Salem City saw its last grocery store close in September 2017. During the award presentation, Chillem described how well the food pantry team and clients at Mount Calvary have received her. “I will show up in our Catholic Charities van, and Steve has his guys drop what they are doing to help me carry the 50 pound boxes or bags of onions, cabbage and other produce into the church. They set up a table for me, and start letting all of their clients know I am here. “Mount Calvary is special too because I see food pantry clients themselves helping as volunteers. It builds the most encouraging sense of community,” she added. While Salem City sits on the outskirts of expansive farmland, with an estimated population of 4,774 (U.S. Census) which is a drop of about 25 percent over two decades, there is a strong and vibrant community network working to alleviate food-insecurity in the area. This is largely accomplished through the Emergency Food Relief Providers Coalition (Food Pantry Coalition for short) which Chillem chairs and Catholic Charities established in 2015. Chillem noted that Fields is a hard-working, active member of this coalition. “Without Steve, and the many other volunteers in our pantries, I could not do the work that I do,” Chillem explained in her acceptance speech at Mt. Calvary. The mission for improved nutrition in Salem County is also shared by other public and private sector groups, including the Salem Health and Wellness Foundation, a primary sponsor of the Catholic Charities program, and The Walmart Foundation, a patron of Catholic Charities’ efforts to increase SNAP enrollments. Together, these diverse groups of corporate, private and faith-based advocates work to combat food insecurity and chronic diseases.